Want to advertise on MuzicNotez? 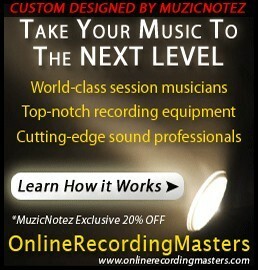 Thanks for your inquiry at MuzicNotez, we're here to help you succeed. There are many facets within MuzicNotez to help yourself grow, and become heard. As you know, it's all about the audiance when you're advertising, so whether you're a company with a service that our members can benefit from, label looking for upcoming talent, or a musician just looking for that chance to be heard by the right people, we can work together to equally benefit from each other. We want to assist you in any way that we can. If you have any questions, concerns, or ideas to bring to us please feel free to contact us at any time. We want to place you on high traffic pages specifically matching your needs, that will get you noticed within our innovative network. Contact us regarding specific placements on specific pages that you feel would best represent your interests. If there is a special part of our site that you feel represents you the best, via video's, audio's, blog's, magazine, etc., please let us know. We are here to work with you to create a relationship and agreement that works best for all of us. MuzicNotez has ads throughout the site to keep our community free of charge to anybody that wants to join. We selectively choose the correct ad's to put on our site to be more geared to your interests in hopes they can benefit you. What Do Our PR Packages Include? Marketing your business, music related company or musician/artist's music in a niche market of growing musicians, artists and fan bases all across the United States as well as our affiliation internationally. You are putting your business into the eyes of like-minded individuals who will benefit from cross-music promotion. Web site impressions increasing continually with our constant growth, average page impressions range from 5-7,000 a month growing by 1,000+ a month avg. Promotional article about our direct affiliation and inclusion as a "recommended MuzicNotez affiliate" which is published in our magazine and several RSS feeds that appear on our homepage, backstage and header displayed throughout every page of the website. Promo Magazine Article also sent out through our newsletter. Custom design Package: $9.99 – Example can be found to the right of the price rates above. Interested in taking out an ad but would like it professionally designed by our design team? We would design your MuzicNotez promo ad specifically to fit with our design scheme so you fit in more and increase interest in what you have to offer. The custom design package is not required and is an extra option for you presented by our design team. It's very simple, we have all of our promo spots displayed in our E-Store for you to purchase right away so we can begin working with you. View all of our promo spots HERE or click on any of the links above in the pricing tables to view specific spots you're interested in. We also are open to different forms of affiliating upon request. If you would like to pursue an advertisement/PR package with us, simply contact us through our contact form with your request and advertising location of interest. Also if you would like to learn more about us, or our specific traffic numbers before you proceed, also please feel free to contact us. Thank you for your interest with MuzicNotez.